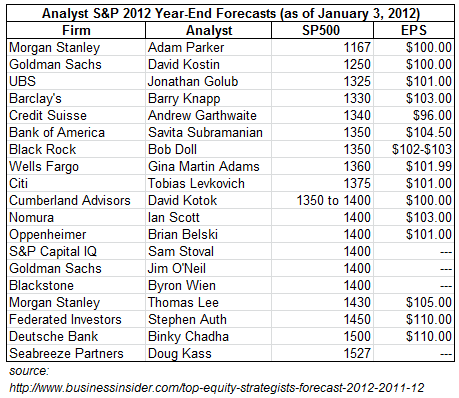 In January of 2012, Barron’s polled many professional analysts for their 2012 S&P 500 price projections. Some have changed their views since then, but let’s use their January forecasts as background for this discussion of volatility implied 2012 year-end price probability ranges. 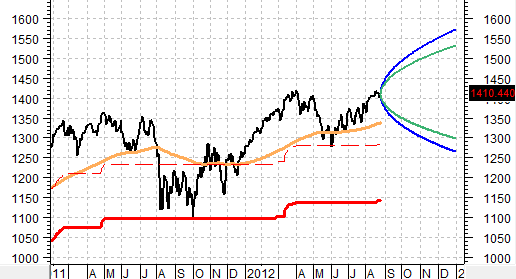 As of this date, Standard and Poor’s is projecting $102 per share earnings for 2012. That’s pretty much where the professionals were back in January, with the exceptions of Morgan Stanley, Federated Investors, and Deutsche Bank, which were high; and the exception of Credit Suisse, which was low. The bulk of the forecasts were for the index to end 2012 between about 1350 and 1400 (with a low of 1167 and a high of 1527). The index today is at 1410. Let’s see what a pure volatility derived guesstimate says. It looks to us like the math suggests a price probability range of between about 1225 and 1575, not terribly different than the range of professional forecasts 8 months ago. Each chart below plots the price (black), the 200-day exponential moving average (tan), the 10% correction level (dashed red), the 20% bear level (solid red), the price probability range based on 6-month historical volatility (green) and the price probability range based on 1-year historical volatility (blue). The logic is based on a normal frequency distribution of prices. Reality is more irregular than that, but this is the math that underpins options pricing, and is typically close enough. The statistical chance of the price being outside of the probability cone is 10% on either side — 10% higher and 10% lower. Based on 6 months of historical volatility, the 80% probable price range is 1298 to 1534. Based on 1 year of volatility, the 80% probable price range is 1263 to 1577. The statistical chance of the price being outside of the probability cone is 5% on either side — 5% higher and 5% lower. Based on 6 months of historical volatility, the 90% probable price range is 1269 to1569. Based on 1 year of volatility, the 90% probable price range is 1223 to 1628. If the price were to fall to the current 200 day average, it would be 1338. If a 10% correction was reached by year-end the price would be 1284. A bear achieved by year-end would produce a price of 1141. Of course, the price will do what the price will do, and important events like a wider multi-country war over Syria, going over the US fiscal cliff, and collapse in Spain would through everything into a cocked hat. In any event, the combination of professional forecasts, mathematically-derived volatility-based projections, and chart support level indications can serve as reasonable aids to forming your own view. Earnings forecasts and estimation of valuation multiples are important too (see our blog for historical and projected P/E multiples from Standard and Poor’s, Seeking Alpha for information about historical trends in S&P 500 sales, earnings, dividends, book value and payout ratio. This entry was posted on Monday, August 27th, 2012 at 9:03 PM and is filed under Data, Interesting Charts. You can follow any responses to this entry through the RSS 2.0 feed. Both comments and pings are currently closed.